THE DAYS WILL COME WHEN THERE WILL NOT BE LEFT A STONE UPON ANOTHER STONE. Our readings this Sunday seek to both comfort the afflicted and afflict the comfortable. As we near the end of our liturgical year, we continue our focus on the end times and the second coming of Christ. In our first reading from the Prophet Malachi (3:19-20), we hear a short but powerful prophesy of the end times that will come "blazing like an oven", yet "healing rays" await the faithful. Lo, the day is coming, blazing like an oven, when all the proud and all evildoers will be stubble, and the day that is coming will set them on fire, leaving them neither root nor branch, says the LORD of hosts. But for you who fear my name, there will arise the sun of justice with its healing rays. 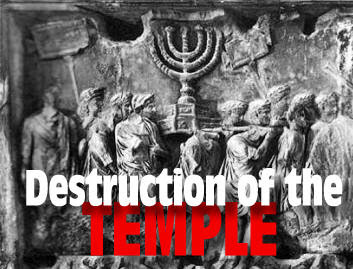 In our Gospel passage (Luke 21:5-19), Jesus foretold not only the destruction of the temple in Jerusalem (that would come to pass in just forty years), but a description of the final days of judgement. As terrible as it sounded, Jesus offered hope to the faithful, "By your perseverance you will secure your lives." While some people were speaking about how the temple was adorned with costly stones and votive offerings, Jesus said, "All that you see here--the days will come when there will not be left a stone upon another stone that will not be thrown down." Then they asked him, "Teacher, when will this happen? And what sign will there be when all these things are about to happen?" He answered, "See that you not be deceived, for many will come in my name, saying, 'I am he,' and 'The time has come.' Do not follow them! When you hear of wars and insurrections, do not be terrified; for such things must happen first, but it will not immediately be the end." Then he said to them, "Nation will rise against nation, and kingdom against kingdom. There will be powerful earthquakes, famines, and plagues from place to place; and awesome sights and mighty signs will come from the sky. In our Epistle reading (2 Thessalonians 3:7-12), St. Paul instructs his community (and us) how to live as we await the coming of Christ, imitating the example set for us and by working diligently for the good of the Church. Brothers and sisters: You know how one must imitate us. For we did not act in a disorderly way among you, nor did we eat food received free from anyone. On the contrary, in toil and drudgery, night and day we worked, so as not to burden any of you. Not that we do not have the right. Rather, we wanted to present ourselves as a model for you, so that you might imitate us. In fact, when we were with you, we instructed you that if anyone was unwilling to work, neither should that one eat. We hear that some are conducting themselves among you in a disorderly way, by not keeping busy but minding the business of others. Such people we instruct and urge in the Lord Jesus Christ to work quietly and to eat their own food. In contemplating all of this, we should remain vigilant, for we know not the hour.